Those who like their films heavily laden with nostalgia are in for a treat with StudioCanal’s DVD release of two Dickensian gems. English director Thomas Bentley’s The Old Curiosity Shop (1934) featuring Elaine Benson and Hay Petrie, and Ealing Studios’ The Life and Adventures of Nicholas Nickleby (1947) directed by Brazilian Alberto Cavalcanti and starring Derek Bond, Sally Ann Howes and Cedric Hardwicke, are not only classic interpretations of these well known stories but are also amongst the best examples of early British cinema. The Old Curiosity Shop follows the fortunes of orphan Nell Trent (Benson) who helps her grandfather (Ben Webster) run his strange bric-a-brac shop. Determined to secure a fortune for his granddaughter the old man borrows heavily from miserly money lender Daniel Quilp (Petrie), eventually losing everything in the process. Forced from their home the two take to the road where they encounter a number of bizarre people, whilst pursued through middle England by Quilp and several other unsavoury individuals intent on taking advantage of Nell and her grandfather’s misfortune. In The Life and Adventures of Nicholas Nickleby, Nicholas (Bond) is found employment by his uncle Ralph Nickleby (Hardwicke) as a teacher at Dotheboys Hall in Yorkshire, following the death of his father. Dotheboys is run by the wicked Wackford Squeers (Alfred Drayton) who holds the school and it’s unfortunate pupils under his tyrannical grip. Shot in black these films have an authenticity in their depiction of Victorian England which modern colour seems unable to capture. 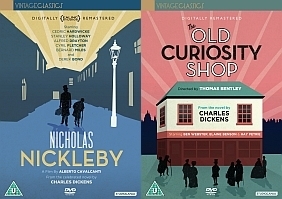 Claude Friese-Greene’s cinematography and Cedric Dawes’ art direction in particular for The Old Curiosity Shop, imbue proceedings with a suitable mustiness, whilst the cast of The Life and Adventures of Nicholas Nickleby, including Sybil Thorndyke as Squeers’ indomitable wife, appear-ready made to portray some of Dickens most memorable grotesqueries. In the present day with a new interpretation of a Dickens’ novel on television every six months, you might be forgiven for asking whether we really need to see old and admittedly (in the case of The Old Curiosity Shop) slightly creaky versions of the same stories. However it seems only appropriate as we celebrate the 200th anniversary of Dickens’ birth, that two of the greatest screen adaptations of his work should be made available once more for a whole new generation to enjoy.